Camp Directors handle the supervisory and administrative tasks of camping or recreation activities. Working the whole year around, these camp directors disburse the following job tasks –designing camping programs, promoting the facility, overseeing daily camp operations, training and hiring staff, handling financial management of the camp, assessing work performance, overseeing camp counselors and other staff, taking disciplinary actions, developing training programs, managing facilities budgets, developing and executing marketing techniques to recruit campers. The skills that are considered paramount for this position are excellent organizational skills, interpersonal skills, and deep knowledge of safety and precaution methods, computer competencies, leadership and familiarity with maintenance equipment. No formal education is needed to become a camp director, but there are many degrees and post graduations that pave an easier path to reach this destination. 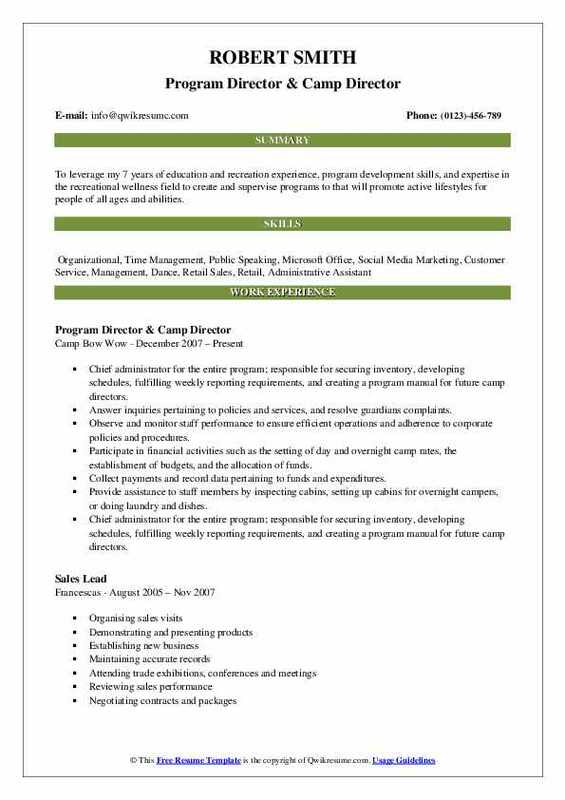 Relevant degrees mentioned in the Camp Director Resume include youth development, counseling, camp management, camp administration, and therapeutic recreation. Headline : Seeking employment that would utilize my skills and experience in the work force. By providing an accommodating, energetic and hard work ethic. It is my desire to participate and coordinate with my colleagues to help produce a quality product, positive work experience, and quality product to ensure customer satisfaction. 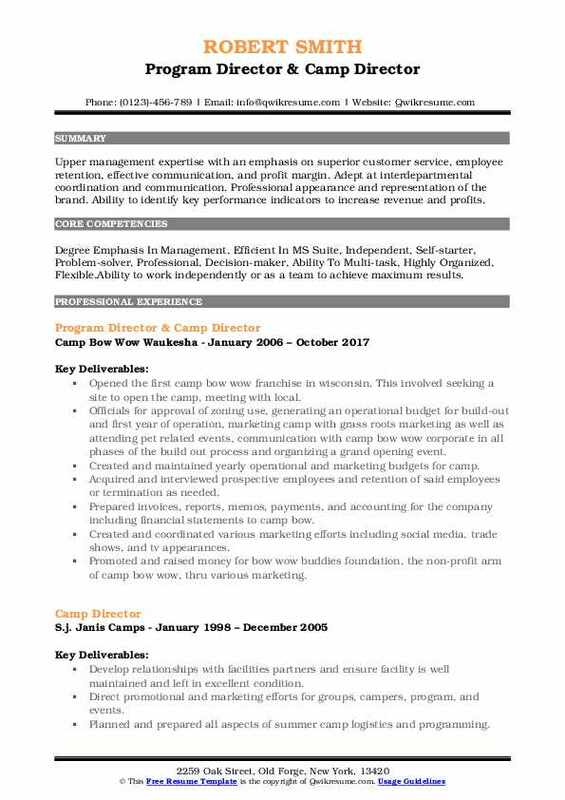 Skills : Energetic,Event Management,Community Engagement, Customer Relations, Coaching,Ms Word. Supervise full-time camp staff and recruit, employ, train, and supervise part-time staff and volunteers. Publicize programs through sources such as newsletters, bulletins, or mailings. Review and evaluate new and current programs to determine their efficiency, effectiveness, and compliance with state, local, and federal regulations, and recommend any necessary modifications. Objective : Flexible, trustworthy, creative and positive; a leader who works well in teams, performance oriented, inspiring, energetic, organized, detail-oriented, communicative, fun loving, and a good problem solver. Responsibilities:Responsible for creating the schedule and coordinating activities and field trips. managed day to day operations of three business lines including a non-profit special. Supervise a staff of camp counselors; providing hands-on direction, staff evaluations, professional development, and a clear delineation of tasks and roles. Planned managed an annual 8 week summer camp for special needs children and adults in compliance. Planned and executed 220 hours of camp programming, including team-building activities, educational games, and hands-on crafts for 25 school-aged children. Provided direct care to persons with developmental disabilities in conjunction with their personal program. Managed and oversaw the maintenance and operations of a 40 site campground year round large event. Human resource duties: position description development, recruitment, interviewing, onboarding,. Organizing/ conducting training and leadership supervision of 15 seasonal and 1 year round staff. Budget development, administration, tracking, reporting of funds in accordance with gaap. Lead fundraising efforts including outreach to donors, event planning, community including annual appeal. Mailing, major donor solicitation, speaking engagements, grant writing compliance, gift processing,. Tax/thank you letter processing, gambling licensed bingo, and donor tracking. Facilitation of the board of directors including administrative support and planning. Summary : To leverage my 7 years of education and recreation experience, program development skills, and expertise in the recreational wellness field to create and supervise programs to that will promote active lifestyles for people of all ages and abilities. 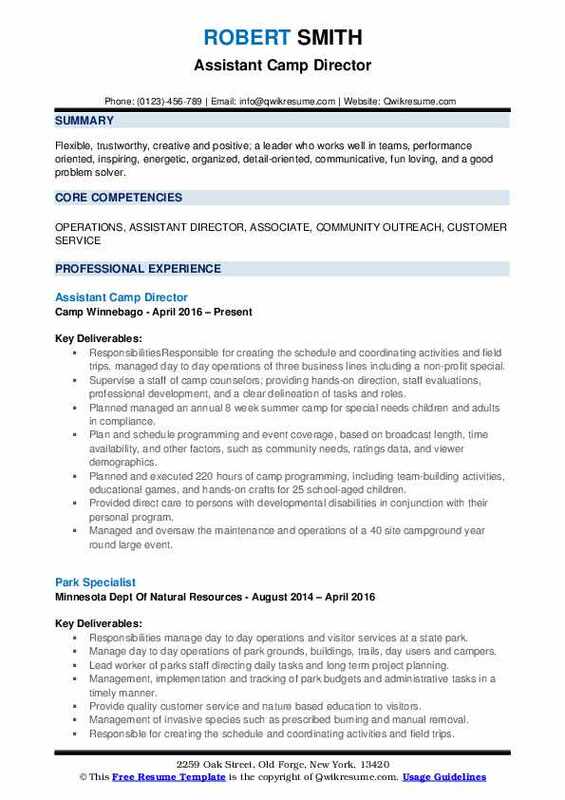 Chief administrator for the entire program; responsible for securing inventory, developing schedules, fulfilling weekly reporting requirements, and creating a program manual for future camp directors. Answer inquiries pertaining to policies and services, and resolve guardians complaints. Observe and monitor staff performance to ensure efficient operations and adherence to corporate policies and procedures. Participate in financial activities such as the setting of day and overnight camp rates, the establishment of budgets, and the allocation of funds. Collect payments and record data pertaining to funds and expenditures. Provide assistance to staff members by inspecting cabins, setting up cabins for overnight campers, or doing laundry and dishes. Receive and process deposit payments, e-mail letters of confirmation, or send dismissal letters when campers cannot be accepted. Develop and implement policies and procedures for efficient daily operations. Organize and coordinate the work of staff and personnel for events held at the facility. Purchase supplies, and arrange for outside services, such as deliveries, maintenance and repair, and retail items. Meet with clients to schedule and plan details of stays, discuss behavioral issues, and assist in any way possible. Headline : Seeking an administrative support position that will allow me to provide excellent executive support and client services while serving as a face for the organization. Work closely with contracted organizations to prepare and implement a schedule of a program that meets the needs of the organizations participates and their safety. Coordinate and schedule staff sufficiently for contracted organizations size and their schedule. Instruct human resource management practices to recruit and maintain seasonal staff. Responsible for hiring, training, managing and evaluating seasonal staff. Facilitated interpreters and made home visits to communicate with parents of campers of whom English was a second language. Focused on introducing students to a variety of activities, such as robotics, cooking, science experiments, nature exploration, volunteerism, rocks and minerals, acting and film, sports, and various forms of art. Educated all employees on the history and mission of the service-based camp. Supervise the daily operation of the summer resident camp including food services, activity scheduling, staff matters, and participant issues. Hire, manage and work closely with the food service manager and review food service program. Conduct surveys for the organizations and analyze them to determine where to make changes. Develop and maintain policies and procedures for accreditation (start to finish the accreditation process). 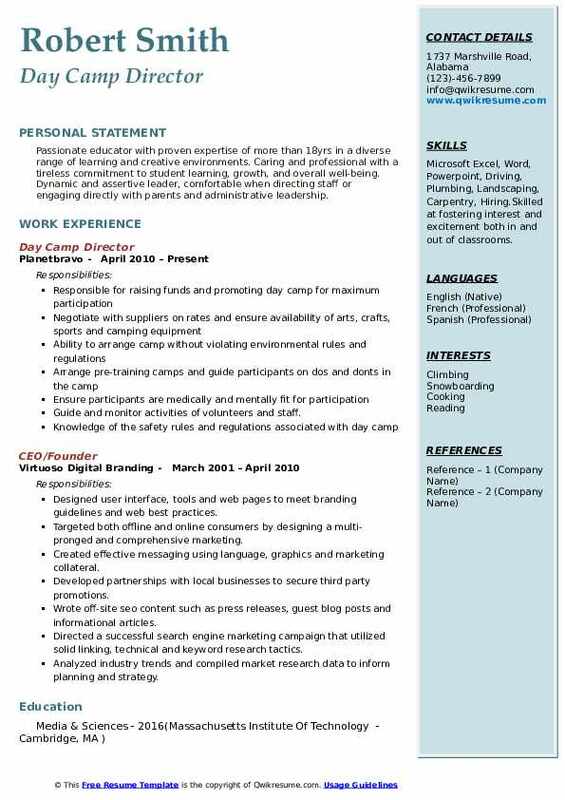 Microsoft word and excel, google docs, customer service, summer programming, and design, recruiting and human resources. Summary : Passionate educator with proven expertise of more than 18yrs in a diverse range of learning and creative environments. Caring and professional with a tireless commitment to student learning, growth, and overall well-being. Dynamic and assertive leader, comfortable when directing staff or engaging directly with parents and administrative leadership. Skills : Microsoft Excel, Word, Powerpoint, Driving, Plumbing, Landscaping, Carpentry, Hiring.Skilled at fostering interest and excitement both in and out of classrooms. Guide and monitor activities of volunteers and staff. Wide knowledge of softball, volleyball, tennis, basketball, arts, crafts, etc.Extraordinary creative skills in developing fun and learning games. Maturity in communicating with all age group of children and their parent. Created user interface design style guide in support of interactive game products. Developed design deliverables that elevated, differentiated and functioned on-brand and on-strategy. Improved students analytical skills by introducing state-of-the-art computer program technologies. Instructor for kids/teens k-9. Teaching mindcraft modding, dslr filmmaking, 2d art animation, 3d. Communicated regularly with parents about daily activities and behaviors. Identified and solved technical issues with a variety of diagnostic tools. Installed software, modified and repaired hardware and resolved technical issues. Hired counselors, lifeguards and bus drivers, managed budget, secured pool rental, and coordinated meals through montgomery county food services. Summary : Very energetic and experienced professional. With 20 years of customer service, administrative services and public relations experience, from entry level to management. Recognized for my ability to build relationships with key personnel and generate a warm and friendly environment . Exceptional trainer and mentor with skills to motivate peak individual performance from team members while driving sustained forward growth momentum. Develop relationships with facilities partners and ensure facility is well maintained and left in excellent condition. Collaborated with the executive director to forecast, develop and administer the camps operating budget. Managed the siblings connections program in conjunction with the department of children and families for siblings in foster care, camp ventures after school educational/enrichment programs, camp homeschool program, adolescent development and team leadership programs, counselor in training and teen leadership programs and operation purple (military program). Developed a program schedule encompassing multiple activities. Managed a program director. 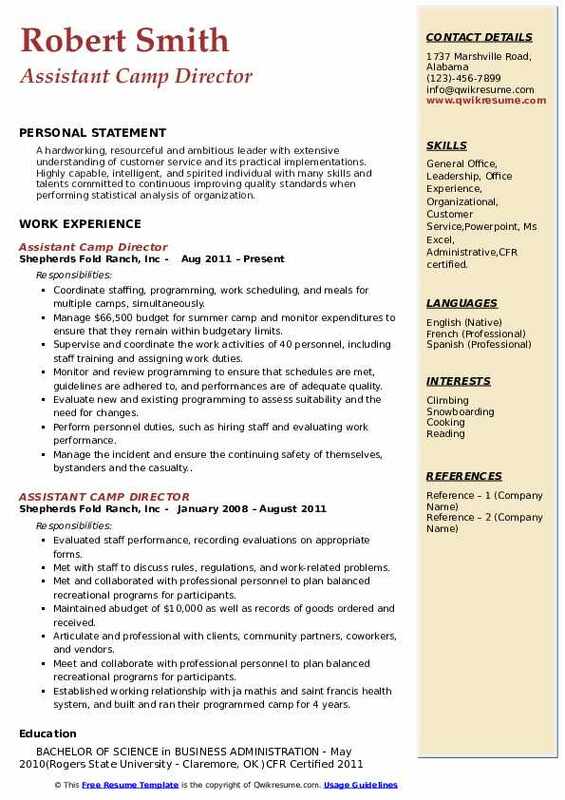 Human resources responsibilities included employee relations, recruitment, compensation and camp policies and procedures implementation. Supervised up to 100 staff, counselors in training and a team of registered nurses ensuring safety of campers and staff. Run daily operations of camp, creating a high energy, fun and creative experience for campers (includes leading skits, cheers/songs, opening closing ceremonies, all camp. Coordinated all camp related licensing and regulatory compliance with the state of connecticut and accreditation with the american camp association. Marketed and led the "weekend" business including retreats and conferences at the camps facilities. Coordinated the camps participation in a fellowship/exchange program in affiliation with the university of connecticut. Hosted a south african student and provided mentoring in sports and recreation programs. Provided guidance to campers to enrich their relationships with peers, parents, and counselors. Develop, facilitate and oversee camp programs including supervision, guidance and direction of camp volunteers and campers for not-for-profit camp committed to providing adventure, fun, hope, and life-changing experience for at-risk children between ages 9-16 who live in adverse conditions in chicagos most difficult neighborhoods. 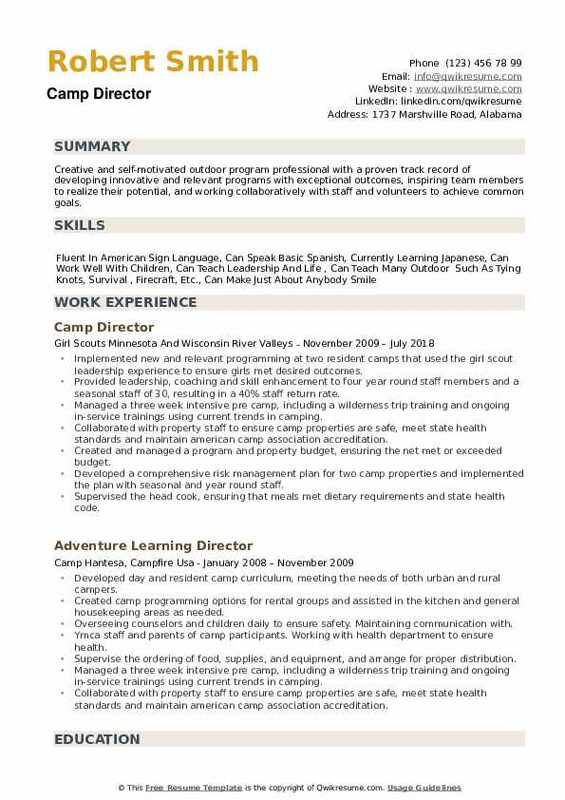 Summary : 10 years of recreation experience from beginner positions to director positions, Seeking an administrative position as a recreation leader for a community based organization. Oversee registration and administrative tasks. Provide exemplary customer service. Conduct training on all policies and maintaining a high level of priority for youth protection laws and safety guidelines. Collaborate with overseeing directors on continuing improvements of camp functionality. Worked closely with executive director to help grow city kids camp from 80 kids to over 200 kids from sos illinois (kids abandoned to the state), william brown elementary, benton house, and from local humboldt park churches. Maintain a safe environment by monitoring camp for hazards and practicing routine safety and emergency procedures. Coordinated new activities through innovative, critical thinking, and interpersonal skills in order to run the summer camp. Provide developmentally appropriate programming for "at risk" youth ages 12 to 17 in a co-ed setting. Develop and provide a variety of student services and programs such as student athletics, academic tracking and athletic eligibility, health and safety. Ensure that all of camp is maintaining health code standards and compliances. Oversee the logistics and regulations of state standards and code compliances. Provide administrative duties such as, scheduling, communicating with parents, record keeping and conducting continuous staff training modules. 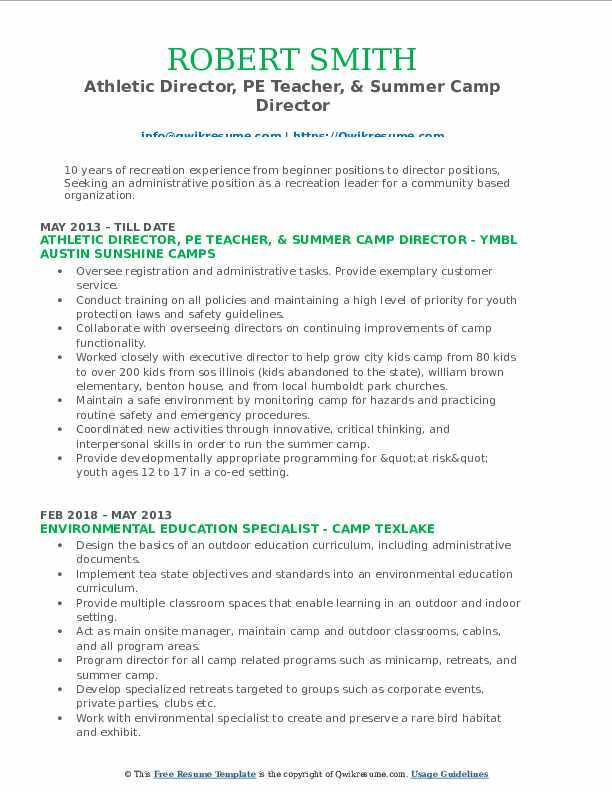 Supervise summer camp including budget, camper recruitment and retention, evaluation, daily operation, staffing, marketing, weekly scheduling, and program. Summary : Upper management expertise with an emphasis on superior customer service, employee retention, effective communication, and profit margin. Adept at interdepartmental coordination and communication. Professional appearance and representation of the brand. Ability to identify key performance indicators to increase revenue and profits. Skills : Degree Emphasis In Management, Efficient In MS Suite, Independent, Self-starter, Problem-solver, Professional, Decision-maker, Ability To Multi-task, Highly Organized, Flexible.Ability to work independently or as a team to achieve maximum results. Opened the first camp bow wow franchise in wisconsin. This involved seeking a site to open the camp, meeting with local. Officials for approval of zoning use, generating an operational budget for build-out and first year of operation, marketing camp with grass roots marketing as well as attending pet related events, communication with camp bow wow corporate in all phases of the build out process and organizing a grand opening event. Created and maintained yearly operational and marketing budgets for camp. Acquired and interviewed prospective employees and retention of said employees or termination as needed. Prepared invoices, reports, memos, payments, and accounting for the company including financial statements to camp bow. Created and coordinated various marketing efforts including social media, trade shows, and tv appearances. Promoted and raised money for bow wow buddies foundation, the non-profit arm of camp bow wow, thru various marketing. Wrote curriculum, planned educational activities focused on math and reading, and coordinated field trips. Organized and directed curriculum of a coding and robotics summer camp for underprivileged youth of color. Fluency in a multitude of different applications and techniques for instruction. Train and educate staff on how to be work with children and convey information. Represented camp at local press events to increase the awareness of the program and highlight need,. 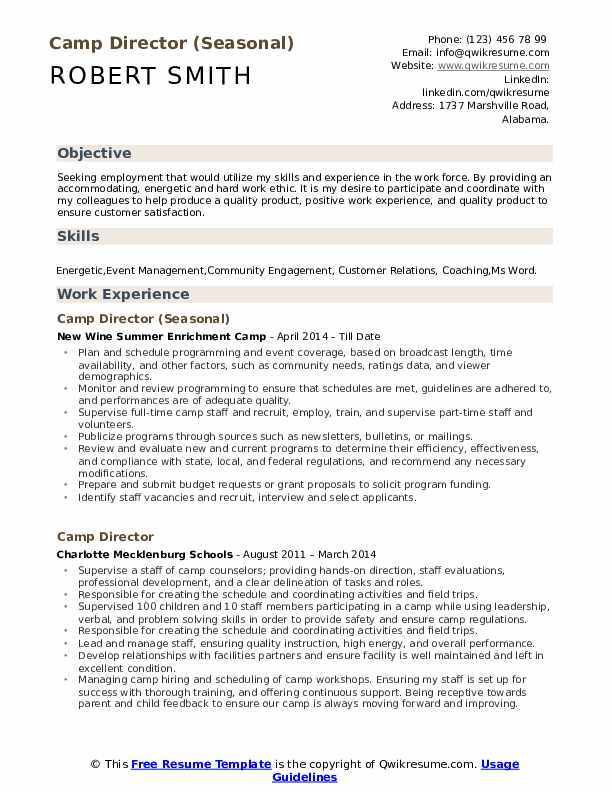 Managing camp hiring and scheduling of camp workshops. Ensuring my staff is set up for success with thorough training, and offering continuous support. Being receptive towards parent and child feedback to ensure our camp is always moving forward and improving. Lead and manage staff, ensuring quality instruction, high energy, and overall performance. Implement conflict resolution between campers, staff, or a combination thereof. Be familiar with of all technology courses in order to aid instructors. Help lead and coordinate camp sessions and responsible for ensuring safety procedures and the health and well-being of campers and volunteers. Summary : A hardworking, resourceful and ambitious leader with extensive understanding of customer service and its practical implementations. Highly capable, intelligent, and spirited individual with many skills and talents committed to continuous improving quality standards when performing statistical analysis of organization. 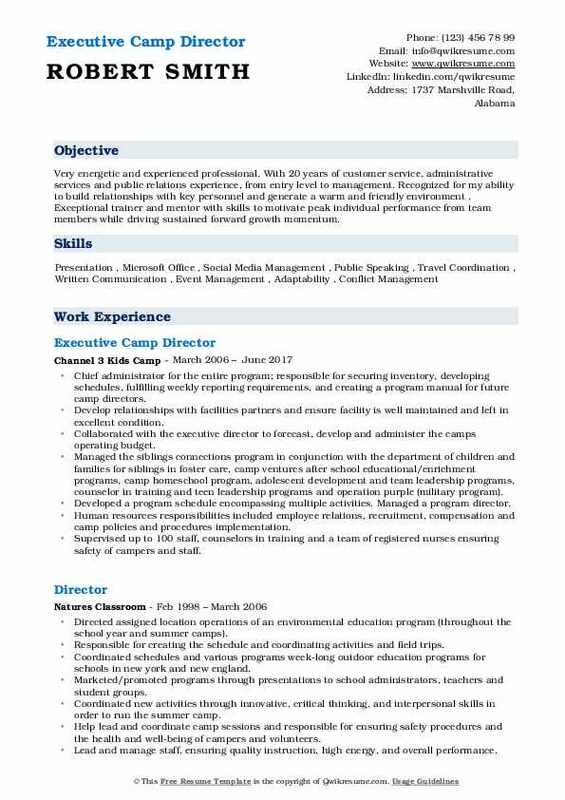 Skills : General Office, Leadership, Office Experience, Organizational, Customer Service,Powerpoint, Ms Excel, Administrative,CFR certified. 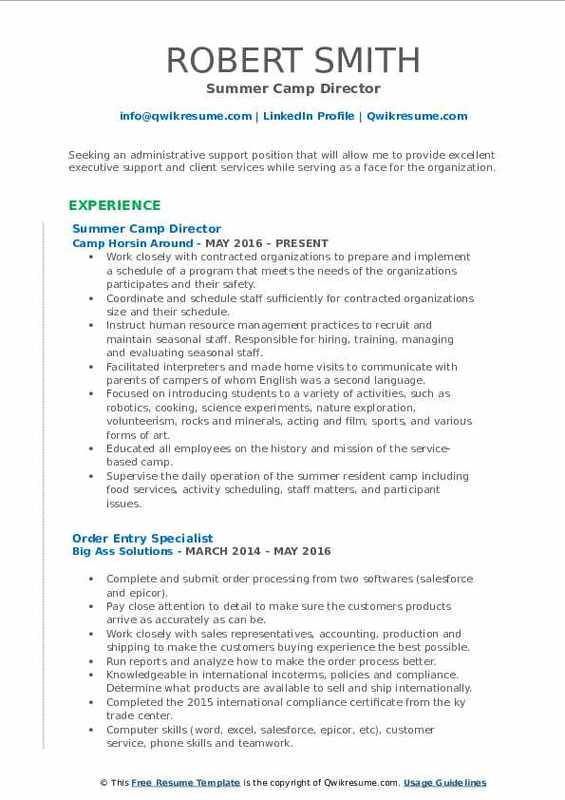 Coordinate staffing, programming, work scheduling, and meals for multiple camps, simultaneously. Manage $66,500 budget for summer camp and monitor expenditures to ensure that they remain within budgetary limits. Supervise and coordinate the work activities of 40 personnel, including staff training and assigning work duties. Evaluate new and existing programming to assess suitability and the need for changes. Manage the incident and ensure the continuing safety of themselves, bystanders and the casualty..
Assess casualties and find out the nature & cause of their injuries with there treatment. Arrange for further medical help or other emergency services to attend. Making decisions related to the welfare, health, and safety of all children and staff,clients, community partners, co-workers, and vendors. Meet and collaborate with professional personnel to plan balanced recreational programs for participants. Established working relationship with ja mathis and saint francis health system, and built and ran their programmed camp for 4 years. Define and monitor crisis management plan, including emergency procedure. Ensuring the program met all state, local and ymca regulations and standards. Supervised 100 children and 10 staff members participating in a camp while using leadership, verbal, and problem solving skills in order to provide safety and ensure camp regulations. Planned and prepared all aspects of summer camp logistics and programming. Summary : Creative and self-motivated outdoor program professional with a proven track record of developing innovative and relevant programs with exceptional outcomes, inspiring team members to realize their potential, and working collaboratively with staff and volunteers to achieve common goals. Implemented new and relevant programming at two resident camps that used the girl scout leadership experience to ensure girls met desired outcomes. Provided leadership, coaching and skill enhancement to four year round staff members and a seasonal staff of 30, resulting in a 40% staff return rate. Managed a three week intensive pre camp, including a wilderness trip training and ongoing in-service trainings using current trends in camping. Collaborated with property staff to ensure camp properties are safe, meet state health standards and maintain american camp association accreditation. Created and managed a program and property budget, ensuring the net met or exceeded budget. Developed a comprehensive risk management plan for two camp properties and implemented the plan with seasonal and year round staff. Supervised the head cook, ensuring that meals met dietary requirements and state health code. Tasks and transitions. Communicate with care takers, employees and administration.